What does the Psychology Today update email actually mean? Do you get monthly traffic up­dates from Psychology Today in your inbox, but you don’t really understand what they mean? You are not alone. The baseline for the Psychology Today update email varies each month. Some of the information is very relevant while other parts of the update have little or no impact on your practice. 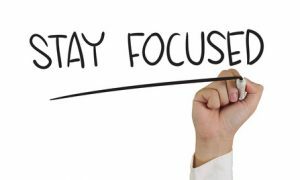 Making sense of your Psychology Today traffic reports is a critical step in understanding what is driving new clients to your practice. Once you make sense of the traffic report, you can tune your profile to get the result you really want — more target clients booked for appointments. What information in the Psychology Today update email is meaningless? “Searches for help in your city and zip” does not provide useful information. The numbers will vary if you are in a big city or a small town. 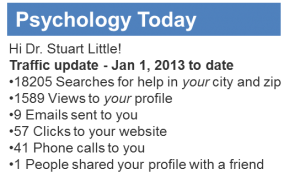 Wouldn’t you like to know how many other therapist listings Psychology Today shows for your area? The more listings, the fewer profile views you will get. If the number of listings in your area is high relative to the number of searches, everybody in your area will have a tougher time. What information in the Psychology Today update email is downright misleading? The date range. Each month your Psychology Today update email will indicate that the number of emails, phone calls to you and clicks to your website is going up. Except, it’s not true. What’s happening is that each month the update email covers a longer period – so even if you received fewer contacts from Psychology Today, the traffic update will never show a drop in leads! Unbelievably, but if you changed your profile picture to a scary face and got no new leads, you would never know it from the monthly email, because each month it shows the cumulative number of emails, phone calls to you and clicks to your website from January 1st. What information in the Psychology Today update email is incredibly useful? The “views to your profile” is a number that you want to see going up. Getting people to view your profile is the first step to getting them to reach out to you. And, you have some control over how often people will click to view your profile from the general Psychology Today listing (that usually shows 20 blurbs). By tweaking your profile picture, for example, you can can increase views to your profile. The number of actual leads that you get (emails, phone calls to you and clicks to your website) is bringing you closer to your goal. If people find your profile engaging, they are more likely to reach out to you. Of course, the ultimate measure of success is converting leads to appointments. You can, and should, measure what happens when a lead from Psychology Today contacts you or clicks through to your website. Do they reach out to you for an initial consultation? Keep track of the numbers, and compare your statistics from month to month. Notice if the profile views, phone calls, and emails are getting higher or lower. If you have a high number of visitors to your profile, yet you are not getting calls, emails or visits to your site, perhaps your profile is not engaging enough. Consider rewording your profile, speaking to the clients in their language, and targeting their pain points. Are you getting clicks to your website? What happens when they go to your site? Do they fill out your contact form, or is there a high bounce rate on your site. Ask yourself if your site is welcoming and engaging to potential clients, drawing them in to reach out to you. Do you need help making sense of you Psychology Today profile. Are you wondering if the monthly subscription is worth it or if you could do better? At TherapyEverywhere, we’re happy to help. As part of our package, we will improve your PsychologyToday profile, and work to make sure that the maximum number of profile view result in appointments. Call today to get help, for a free 15-minute consultation, or just go to the sign-up page and get started.